This edition is aimed at students, teachers and researchers alike. 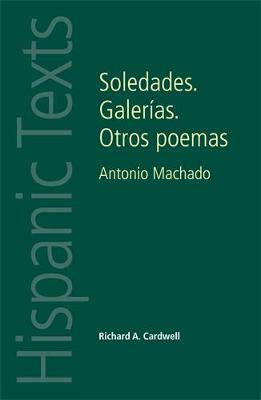 It presents an alternative reading of this seminal collection of poems. Unlike other editions, the introduction and the notes to the poems are in English, with an extensive vocabulary at the end. Cardwell specifically situates the poet in a special context: his early intellectual formation in his family, in the Institucion Libre (the only secular school in Spain at the time), in the Symbolist circles of Paris and, most importantly, in the ferment of ideas of the young artistic circles of the new century, especially the Helios group of 1903-04. This environment served to shape the intellectual and poetic vision of Soledades. Galerias. Otros Poemas. Thus the poet's maturing vision is traced over nearly three decades, highlighting how the burning intellectual ideas and ideals of the day, together with the poet's own spiritual crisis, shaped and were articulated in this major collection of the period.